365 Days Of Trash: The Answer To Plastic Water Bottles? It would be fine for areas where the water is undrinkable due to contamination or microbes. But it's still unnecessary for most of the developed world. Disposable packaging is disposable packaging. And bottling and shipping water, a resource that runs from the tap, is not eco-friendly. So, while it's an innovative design and could be great for countries where bottled water is a necessity, I really can't think of a use for it here. Thnaks for the comment. I definitely agree that most of the developed world doesn't need this but that's why I started the post the way i did. We still need to cut down on bottled water, but for those areas where it is a necessity, I think this is a great thing. Biodegradable packaging is far better than non, and since the bottles can be made from locally sourced materials the potential fro not shipping it is far greater. I think this is a big step in the right direction. That said, I have taylored the opening of the post a bit after reading your comment. See what you think and let me know. That's really interesting--thanks for sharing. Es muy bueno lo que estas haciendo amigo!! Do you speak spanish? I have not gotten paid a single dime for "plugging" these things. If I were there'd be a lot more links to things to buy now wouldn't there. And trust me, the day that happens, everyone will know. i have no problems with full transparency. Couldnt help but notice some of the arrogance here. No doubt those posted were americans. "I really can't think of a use for it here." *whew* i almost fell over reading that stuff. I suppose you folks arent paying attention to what's going on around you are you? Do you know there is a 7000 mile 'slick' of trash in the north pacific ocean? Or that plastic doesnt biodegrade? How many trees got harvested for the fast food ads that fill your mailbox? Perhaps a simple excersize like THINKING would help before stupid, arrogant things fly out of your brain and through your keyboard. THink of it this way. Most communities PAY for weekly trash removal. If you could reduce the amount of trash you put out think about how much money you wouldnt have to pay the city or its subcontractor. I have the biggest lot on the street (for miles around me actually) 2.5 acres and i put out a 3/4 30-gal trash bin maybe once a month. I have a beautiful yard an autorepair garage, two dogs and all is recycled with the exception, of course, of the canine feces. "I really can't think of a use for it here." Your argument is that we should reduce our garbage. That's exactly my point. We don't need ANY kind of bottled water because we have clean running water from our taps. No need for packaging of any kind, whether plastic or biodegradable. I'm advocating NO disposable bottles at all. Where is the arrogance? Please explain. Anonymous - perhaps you are right. On the other hand, I choose to be a bit more optimistic about humans. I have seen many people change and give up bottled water completely when they understood the effects of their actions. Bottling water is very, very damaging to the environment, and not just because of the bottles it is shipped in. Extracting water from one place and shipping it to another is not environmentally-friendly, no matter what the packaging is. Please, please tell me in what way you hear me being arrogant. I really want to know because maybe I need to change the way I come across online. But my convictions are completely sincere and while I enjoy a good debate, I'm not a big fan of name-calling. This is very interesting, but feels like reinventing the wheel. Is there a reason glass bottles can't be used? When I lived in Cameroon they had big plastic baskets (I think they're called crates) that would come with glass bottles of whatever you wanted to buy to drink. 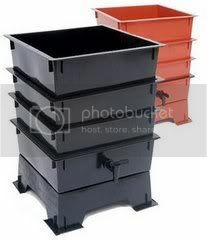 Instead of buying a gallon of Coke or Malta you would buy these crates and when you ran out you would take them with the bottles (all were automatically rinsed after use) to the vendor where they would be cleaned and re-used. Everything was re-used, even the crate. Isn't this better than bio-degradable? I don't mean to be mean, but this kind of reminds me of that pen that was invented to work in outer space that cost the US millions while the Russians just used a pencil. If there is a reason, SORRy. You definitely have a point. OF course the glass is heavier and therefore more energy dependent to transport, and there is the water and energy used in washing the bottles, which would need to be compared to that used in making these. The ironic thing to me is that this is a "solution" to a "problem" that has largely been create and then fixed by commerce not necesity. Look at the US. Bottled water is a luxury, not a need, to the majority of us and yet is till a huge problem. It's a situation that makes little sense to me from the get go. I know that you're looking at this for 3rd world countries, but I'm hoping that one of the companies that produces bottled water here will pick up on this. I'm allergic to chlorine (even very small amounts), so tap water's a no for me, and I'm also allergic to most metals, so buying larger containers of spring water and using them to refill a reusable water bottle isn't exactly practical, either. This has left me using single use plastic water bottles, with the only thing I can do to slightly reduce the waste of this being to buy water from as close to me as possible. If I could get my water in bio-degradable bottles, instead of metal or plastic, that would reduce the footprint of my water consumption considerrably. Have you looked into getting a filter to get rid of the chlorine in your tap water? I'm a high school sophomore in North Carolina and recently did a project in an AP environmental science on plastic water bottles. I learned how terrible water bottles are for the environment. The fact that plastic water bottles take thousands of years to bio-degrade amazed me. 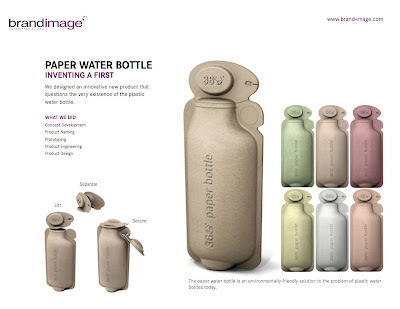 But this paper water bottle seems to really be the solution for undeveloped countries that do not have safe drinking water. But the paper water bottle is still waste. So, my question for you Dave is, how long would it take for one of those paper water bottles to bio degrade? I seem to recall them saying it would be gone within a couple of months in a working composter but I'm not sure off the top of my head. What's more important than the time period though is that when it breaks down it is inert and that it can be made from locally sourced materials. That's the key. This article is not entirely accurate. The main point seems to be that paper bottles are better than plastic bottles. Not true. Paper requires more energy to produce and to recycle than plastic. Paper also takes a long time to degrade in the ground. If a paper bottle fad ever caught you can bet that most paper bottles would be from non-sustainably sourced lumber as well. So there goes more trees. And plastic bottles also have more utility than paper ones would. I know people who have made rain catches out of plastic bottles. I doubt doing that would be possible with paper. Calling a paper bottle an "answer" is wrong. Its not an answer whatsoever. At best its a stop gap, at worst its more damaging than plastic. An answer would be to eliminate the use or paper and plastic for bottles, as both are not reusable. Re-usability is the key. And the one thing that is reusable is steel. 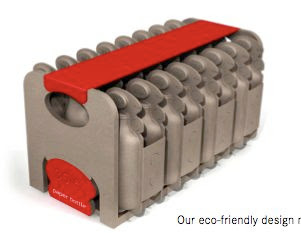 Provide incentives for the use of steel bottles and provide refilling stations. Yeah, its a long shot, but its much more of an "answer". I would look at this step as more of a productive stepping stone than a full out answer. Everyone already knows the answer, found (in more developed countries) through the steel water bottles and their refills. Unfortunately, one of the things that plastic water bottles still has over the refill is the ease of buying a new one. If a person is at a sporting event or is out driving all the time, the easiest thing seems to be to buy a new plastic bottle when the old one runs out. Going into a covenience store, there is no tap water refill station, unless you fancy trusting the bathrooms sanitation. While some people may not have an issue with that, there are just as many who choose not to trust a public place's sanitation. So while the present "need" persists for quick and easy water bottles, I think that the interlocking paper water bottles are rather ingenius. Wow! This is really interesting! 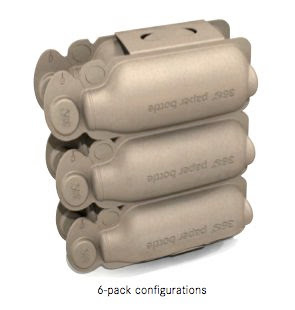 I like the idea of biodegradable water bottles. It's really cool. Also, what I found to be useful was to reuse plastic water bottles. I mean, as long as you clean them before each reuse, they aren't harmless.